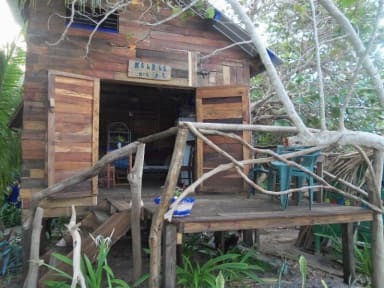 Kismet Inn i Hopkins, Belize: Bestill nå! 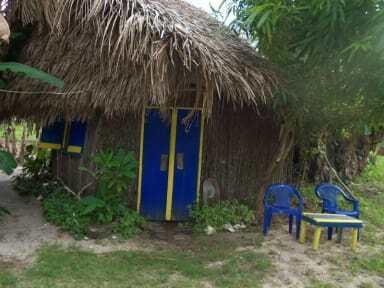 We also have a a cultural house with full kitchen built with a thatched roof and palmetto cultural style. It sleeps 2 or more, we can add a single bed if needed, it also has a loft that sleeps 2 on a double mattress. The family room for 6 sleeps actually 7, 3 single beds in the day room and 4 in the 2 double bedrooms (extra persone USD17.50). We have 2 more double rooms with double beds, one has private bath, the other double bed, it shares a bathroom all have separate entrance and doors that lock off the rest room with a connecting to another other larger room that has a single and double bed in it. All rooms have lock boxes and burglar bars on the windows. We offer free bikes for around the village shopping and WIFI. We offer laundry for $7.50 and book land and sea tours an the most affordable prices.